It’s kind of hard to tell from this photo, but the dark ground is actually burned grass. In total, about an acre of grass burned. 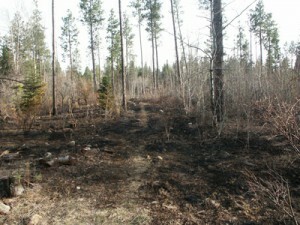 A couple of years ago we had a little forest fire experience on our property. Now, keep in mind that we have been lighting fires on our property for 13 years and this was our only mishap. We have about 7 acres of trees, so cleanup is an on-going activity, and once you cut up a tree for firewood, you have to deal with the leftovers, called the slash. So in April of 2009, we were walking around the property trying to figure out what our next cleanup project would be, and Steve decided to have a small bonfire, because, you know, we’re pyros. He choose a small, and I mean small, pile of old sticks, cleared the grass around it and lit it up. We felt pretty secure having a fire because it had actually snowed the day before and the ground was still quite damp, although the dusting of snow had melted. Piece of cake! Well, I was busy fiddling around in the woodpile behind the barn when I heard an ominous crackling noise. I knew the small fire Steve had planned shouldn’t sound like that. I turned around and saw a four-foot wall of flame in the forest! I ran back there and Steve was beating at the flames with a shovel. I shouted to him that trees were going up in flames and that I was going to call the fire department. I ran back to the house and made a 911 call in a severe panic. It caught really well because that is a part of our property that has a lot of tall grass growing in the summer and we don’t ever cut it. So in the spring, there is a lot of trampled down dry grass. The good news is that even though some small trees and bushes burned, most of what burned was grass that was covering a lot of old slash. So that summer we got a lot of that area cleaned up and took care of a lot of dry fuel that could have been a problem in the future. The grass in that area grew back bright green within a few weeks and we’ve never had a problem since. We’ve both been reluctant to light fires since that incident, but we are always careful. One of the great things about living out in the country is the freedom to burn stuff. Sometimes nature takes things out of your hands though.